Introducing the new alpinedrones X quadcopter. 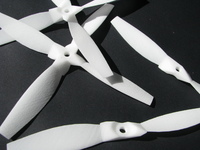 It's supposed to be a relatively light weight perfect X frame for 4" props and 1306 or 1804/1806 motors. The built should be self-explanatory and done in a few hours. All components can be swapped to a new frame within minutes. The FPV mount doubles as Mobuis/Runcam/808 mount. (supposedly) FINAL UPDATE 19.4.: the last 4" and the 5" design seem to work really well, so there's not much left to change. two new files: a new fpv mount for board cameras and a new top plate. these two attach to each other with two rapstraps. should work much better than zipties. I use ABS most of the time and recommend it for this print. Use 3-5 shells and 70-80%infill for the body and a bit less infill for the top part. The FPV mount is printed lying on a side from a soft material - I used Soft PLA for my print.